By that afternoon, MPR was already selling T-shirts and tote bags.To get the products ready to sell that quickly, the station needed a cross-functional effort. As soon as MPR realized that the raccoon story was taking off, leaders from marketing, communications, and member and audience services began meeting to discuss how they should respond. The team held in-person huddles to discuss their plans. “It did help to have some really fast face-to-face meetings so we could get all the issues out and get them resolved within a smaller group as we needed,” MPR membership manager Bob Breck said. Each department put less urgent projects on hold and appointed a point person to handle the onslaught of the raccoon story. Other staffers, meanwhile, took over projects that still had deadlines. “We put the projects that can’t stop on part of the team and we usually appoint one person to handle the hot topic that’s happening at the moment,” Van Zandt said. “They tweeted it, and we grabbed onto it,” Van Zandt said. MPR recently switched its e-commerce to Shopify, which was able to efficiently add the items to the site and manage sales. It then used Point B Solutions, a Minnesota-based company, to print the shirts and handle fulfillment. They’ve gone through multiple printings but decided to limit the number of runs. Previously, MPR has used its various email lists — comprised of both members and non-members — to promote merchandise and to push memberships, but with #MPRraccoon, it decided not to utilize those platforms because the conversation was so driven by social media, especially Twitter. "We let [Twitter] carry it.” Breck said. 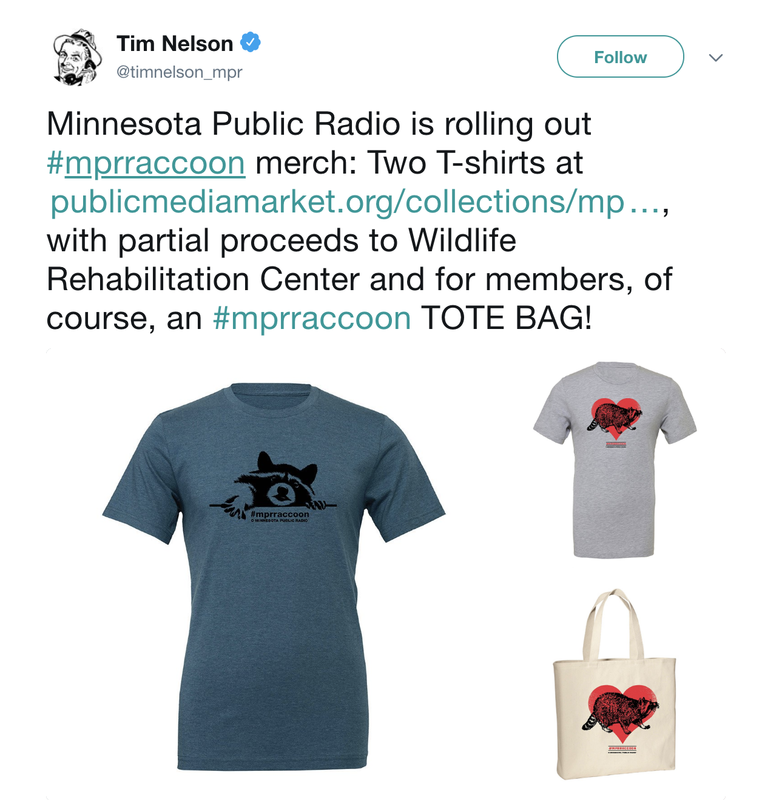 One of the other early decisions MPR also made was that it wanted to donate some of the proceeds from the raccoon merchandise to a wildlife conservation organization, so it also spent some time looking for an organization with which it could partner. The station only ordered a limited run of shirts. One design is sold out, and it’s already sold out of shirts in the other design in size Medium and Large. With the tote bags, MPR has had 273 donations, which includes support from 88 new members. To receive a bag, new members had to pledge $5 per month. Existing members had to increase their contribution by $5 per month in order to qualify for the bag. Sustaining members, who make a monthly donation, also receive one gift from the station each year, and sustainers could have chosen the tote bag as their annual gift if they hadn’t received it yet. 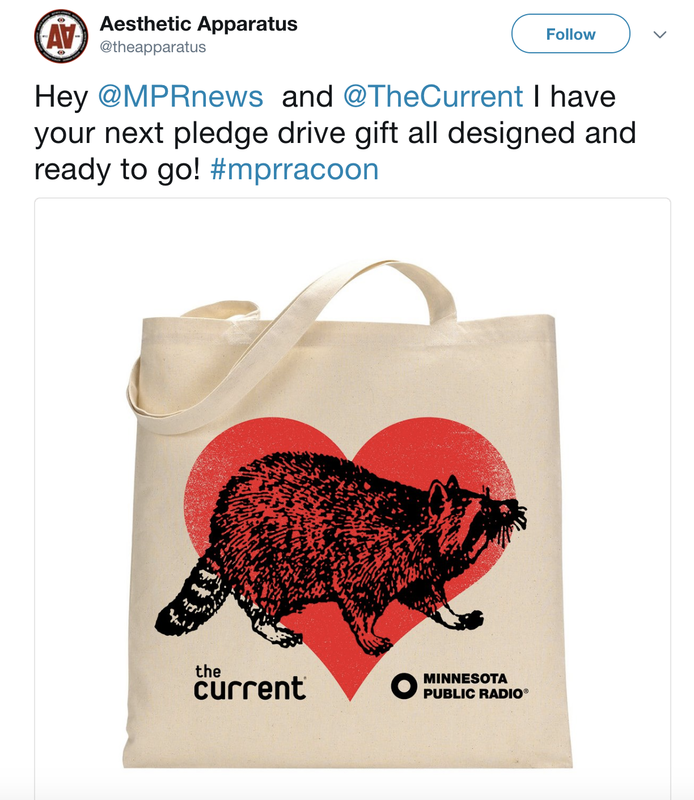 When I spoke with MPR last week, the tote bags were on back order and the station was planning on fulfilling the orders as quickly as it could. In its fiscal year ending in June 2017, MPR raised $22.8 million in individual gifts and membership, about 24 percent of its total earned revenue of about $96.4 million. • Give people choices: Membership is the lifeblood of public media, and some of the earliest conversations the MPR team had around #MPRraccoon was about how it could offer membership perks. “We wanted to be able to accommodate people who were members or wanted to become members and also people who did not want to become members. So having something to offer either of them, but still having something that was a little more special for members was where we landed, and I think that worked that out well,” Breck said. Given the global interest in the raccoon, MPR also recognized that membership wasn’t a feasible option for everyone who was interested in purchasing merchandise. 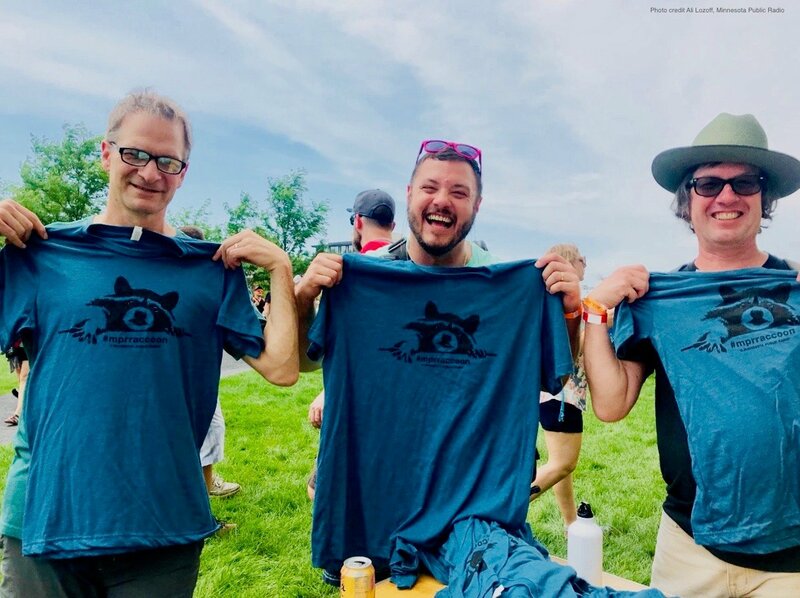 By selling the T-shirts to a wider audience, MPR was able to reach people who otherwise wouldn’t join the station or really have an excuse to interact with MPR. “People have different relationships with us and they will have different relationships with us going forward. We wanted to be as inclusive as possible," Van Zandt said. The T-shirts are also a relatively easy entry point for MPR to begin relationships with potential listeners and members. By selling them shirts, MPR can work on moving them down the engagement funnel into ultimately becoming members. The tote bags also enabled MPR to deepen its relationship with existing members who decided to increase the amount of their monthly sustaining memberships with the station. By maintaining different types of products, MPR was able to reach new audiences and also connect with its most loyal supporters. For MPR to truly take advantage of this opportunity, it needed to move fast, and it did. “We recognized that it was a moment in time that we could participate in for the benefit of our audiences,” Breck, the membership manager said. One of the reasons MPR was able to mobilize its team so quickly is that it’s been through similar circumstances before. When Prince, a Minnesota native, died in 2016 MPR similarly mobilized to respond to the news. The Current, MPR’s music service, switched to a Prince-only playlist, MPR handled interview requests coming in from around the globe, and it also in short order planned a block party to celebrate Prince’s life. 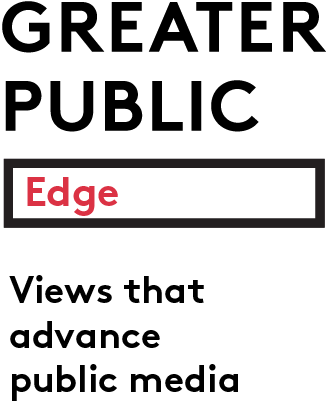 “It was across departments and involved people working together to really listen to what our audiences were wanting and seeing and determining the best way we could respond,” said MPR Director of Communications Angie Andresen. Because it had been through this type of viral moment before, MPR knew how to respond and how to organize its team. You can never really predict when stories like this will take off, but it helps to be prepared for when they do catch on. MPR is focused now on fulfilling all the orders, and in many ways the station has already gone back to normal operations. “It is what it is at this moment. I don’t think raccoons are going to be taking up all of our time,” Van Zandt said. The membership team, meanwhile, is planning to analyze the membership boost that resulted from the #MPRraccoon, and it’s going to examine how it can best keep those members engaged and ultimately retain them.